One of my many confounding questions is why readers keep coming back to Krahnpix. I have chased dead ends, missed humourous opportunities by a city block and unintentionally, as well as intentionally, confused everyone at some point. And yet here we are! Just as confusing is why people like some wildlife photos better than others even though the photographic quality seems comparable to my squinting eye. Enough with questions and time for answers! This week I solved the latter knotty problem, knocking off one of life’s great mysteries. It’s all about familiarity. People prefer pictures of wildlife that they have actually seen. For example, a deer is a pretty good-looking animal. The problem comes if you see a couple on your lawn every morning. The thrill just doesn’t last. A deer in interesting light still gets me only a one on the familiarity index. That all seems pretty straight forward but there’s a tricky part. If you see a photo of a creature you’ve never seen before, then the photo is once again less appealing. “What is that thing and which end is the head? To help make sense of this phenomenon I created a helpful system called the familiarity index. A simple number can now provide an accurate prediction of public response. When Krahnpix readers see the wildlife familiarity index referenced all over the web, they will knowingly smile. You read it here first. The fine print. Of course the system completely breaks down if the creature happens to be particularly cute – life is not fair even in the animal kingdom. The system also doesn’t work in landscape photography. People who have never seen a sunset, palm tree or an ocean are put into a natural swoon when all three appear in a photograph. Krahnpix only gets you so many explanations. This is a five on the familiarity index and one of my new favourites. Oh, that first owl looks so annoyed! That’s a nice cuddly owl. They really are fluffy. If they’d hold still they’d make a nice pillow but you wouldn’t want to get on the wrong side of that beak. I like your logic here…a bit like absence makes the heart grow fonder. As always, beautiful photos and great lighting. That’s a great summary. I should have included it. Glad you liked my owls. I am slow at catching up with you and everyone else these days. Rick’s mother is now on home Hospice. I am looking forward to the extra help, and a little more sleep. So sorry to hear your days have been filled with the challenges of an aging parent. Hopefully the home hospice can help the situation. Life can be difficult at times. As for the rare photos, I suppose low interest in the photographers contributes to the rarity:) Glad you liked the less rare owls! Beautiful light and comp. on these! I appreciate that. It was a wonderful evening watching that beautiful creature. Wonderful post and photos as usual. It is so different in different parts of the world as to what folks think is familiar. It also depends on what one thinks is fun or interesting to photograph. Insects are pretty cool and can be ferocious just like a big grizzly – to other insects. It all depends on your perspective on things. I think if I saw a Sasquatch, composition, lighting, perfect exposure, and making a great photo would not even enter my head. I would care mostly about FOCUS and GOOD ENOUGH! I hope Jeff gets us a Sasquatch. I hope Jeff gets a Sasquatch too. That would make for a great post. The funny thing is if I ever saw one, I theoretically would be trying to compose a great picture because all that would be going through my head would be those blobs of nothingness photos that people claim to be one. In practice I’d probably get a blob. I agree that the smaller world of critters can be ferocious. I was reminded of that last week when I was stung by a wasp. Beauty and interestingnesss (I love that word) definitely depend on a person’s biases. Hi Lyle, interesting, just read on a webpage for birders that the favourite shots are the chickadees and eagles. There is a story behind every photo, and I keep coming back because you do such a great job of making sure the rare and inspired animal dialog happens (at least in my head) no matter how common the creature. If I can make something happen in your head then I must be doing something right! I’m glad you keep coming back. Interesting. I do need to see your photos of the Sasquatch! They are very blurry. You can’t even tell what it is. Good try, but I don’t think you’ll ever peg the human mind into anything resembling a scale. I do love that first shot with the owl (wonderful critter!) looking at you and perfectly lit. The deer… far too common as garden pests to be considered, though I once was thrilled at spotting one soon after moving out of the big city. Then having bashed into one or two, resulting in some nasty auto repair bills… not so much. The last shot of the owl. I keep going back to see if I can get it to turn its head. I just consider you very, very lucky to catch sight of these magnificent birds, not to mention getting such fantastic shots of them. Thanks for giving me points for trying but sadly I think you’re right. The human mind is not easily cornered or explained. Sorry to hear about your close encounters with deer. Personal experience experience can definitely colour our view – I just got stung by a wasp and think a lot less of the them now! 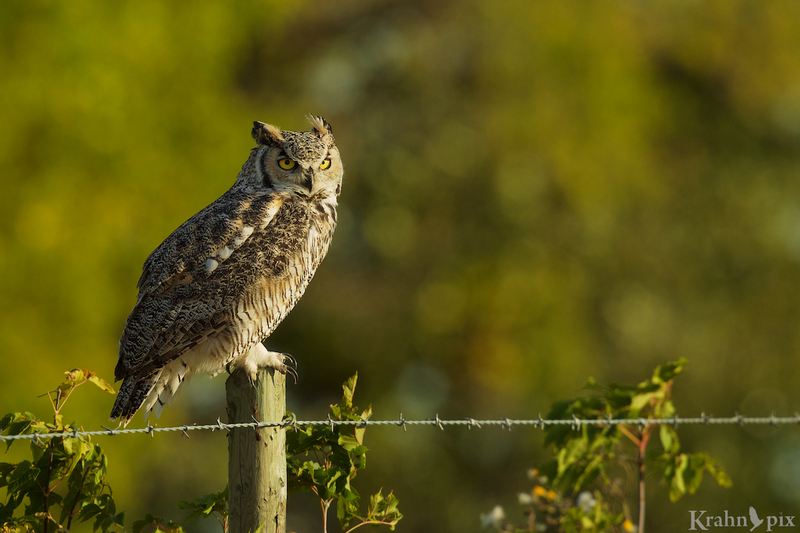 I was so fortunate to see those owls in good light and I’m still smiling about the experiences. I used to get occasionally dumbfounded by editor’s choices years ago, and I am often confused still by popularity of photos in contests and other arenas of social opinion. To me, I still like when someone captures an image with great lighting and composition (no matter how familiar the subject), which you do on a regular basis. I like your bell curve scale idea, but somehow you need to factor in lighting, composition, and an animal cuteness index. If you figure out how to write that software, I’ll be the first to buy! Ya I probably won’t be figuring out that anytime soon. Just a slice of it was confusing enough. Like you I’m often confused, and occasionally frustrated, by what is deemed popular but I need to get over it and just focus on the photos I like which is often the same as other photographers. Like you said, lighting and composition are huge factors in determining great photos. Difficult to understand people’s tastes, there are pictures that we feel very good but instead are not considered, others that are highly successful. Everything is subjective in photography. I like what you wrote, but above all I love your photos! You are so right – it is very difficult to understand people’s tastes but for some reason I keep trying to figure it out. The subjectivity in photography is too great and I think I should learn to let it go and just enjoy the good ones. Glad you enjoyed the post. A friend of mine told me his big animal shots sell the best..birds are not popular. I think everyone has their favourite animal and they will stop to look at another photo of them. i think you are right, but for me it is great composition and light that gets my attention not the camera or even the animal or bird. Those are good thots. For me, if it isn’t a good photograph, then it doesn’t really matter what the subject is – I’d rather look at something with great composition and light as you mentioned. Clearly others have different perspectives. You are dead on in my opinion. I’m an Alaskan based wildlife photographer, and face my camera toward birds a lot. As such, one of my outlets for photography is a “Birds of Alaska” Facebook group. In that group, familiarity is EVERYTHING. A mediocre image of an eagle or black-capped chickadee will receive significantly more attention than say, an incredibly lit, full-frame brown creeper with its tongue out scooping an insect out of a crack. Broadening this concept to online print sales, you’ve nailed exactly what it takes to garner recognition on the internet. Great photographs of familiar wildlife will sell exponentially better than truly incredible photographs of non-familiar things. I was very interested to read your perspective. It can be frustrating for photographers who don’t want a mediocre image of anything but all the more reason to pursue what we like and ignore what’s popular. Hmm, that’s a very interesting analysis. My question is, what time of day did you catch this magnificent owl? I hear many of these creatures calling to each other at night, yet I’ve never spotted one. I’m very jealous of these beautiful captures! The photos are of the same owl. The top one was earlier in the evening and the bottom one was just before sunset when I was doubly pleased to find him again. Needless to say it made all the driving around well worth it. Those are excellent reasons to like a photo:) Glad you enjoyed them. I managed to find two great horned owls this week and was over the moon. You might say I don’t see them every day! I am regularly confused by public response and I’m guessing it will still be the case. It’s still fun to speculate because I like to question why. Let me know if you come up with another theory. Glad you liked the photos. Haha…great analysis and insight on this topic! Sometimes I think the position of the moon influences what photos people like! 😉 Great photos as well. Ah yes the positioning of the moon! That is a difficult factor to put in a formula but I’m sure it has a bearing. Well that would be refreshingly different:) I was curious to see what people would think.